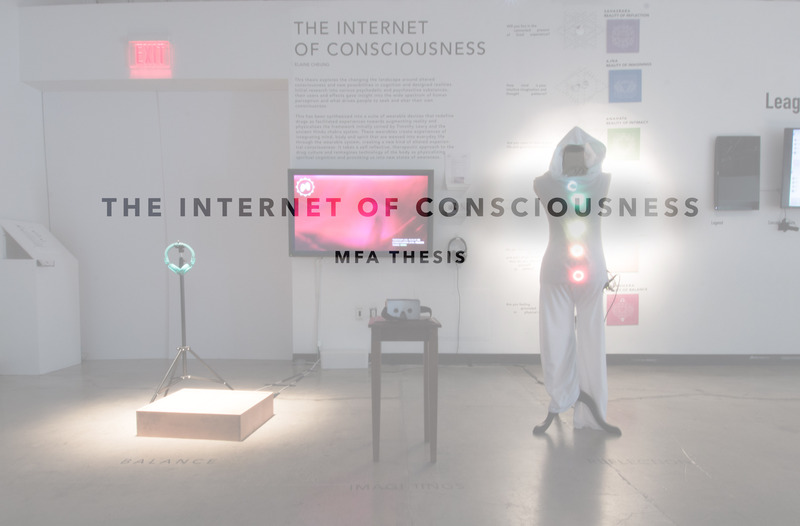 The Internet of Consciousness explores the changing the landscape around altered consciousness and imagines a suite of products catered towards a user’s journey into Self. These wearables create experiences of integrating mind, body and spirit that are augmented into daily life through the designed wearable ecosystem, creating a new kind of altered experiential consciousness. It takes a self reflective, therapeutic approach to the pervasiveness of recreational and illicit drug culture in our society and reimagines technology of the body that can provoke us into new states of awareness. To open up questions and research into consciousness and reality, the Internet of Consciousness ecosystem serves an embodiment of explorations around the subject of CONSCIOUSNESS through experiential objects, prototyping and systems design. It grapples with questions of subjective reality and perception, new understandings of altered and psychedelic states and imprints of experience on one’s consciousness. Research and study was devoted to determining how recent breakthroughs in consciousness and adulteration in drug use can be used as tools and affordances for design. Looking into the scope of current drug use required anonymous user interviews, surveys, trip reports and observational field immersions into organizations, conferences and environments catered to current trends in recreational and medical psychoactive use.